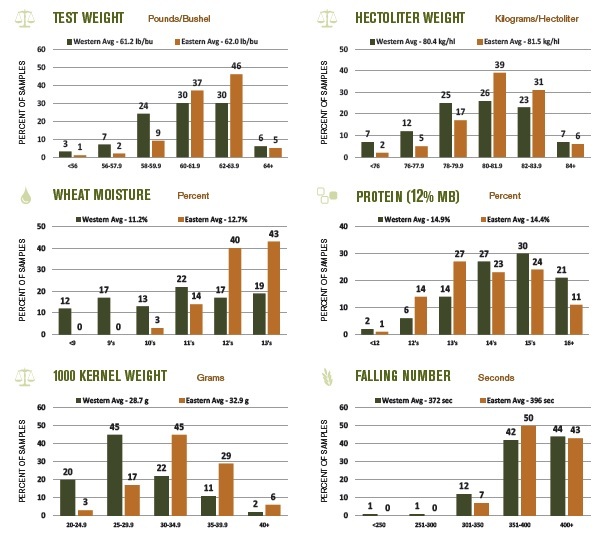 ABOUT SW WHEAT Low protein, low moisture wheat. Soft endosperm, white bran, weak gluten. Used in pastries, cakes, biscuits, crackers, flat breads, Asian-style noodles and snack foods. Can also be used for blanding. 512 Soft White and 96 Club SamplesCollected from state, private grain inspection agencies and commercial wheat handling operations. Wheat Marketing Center (WMC) conducted wheat and flour quality testing and analyses. Federal Grain Inspection Service (FGIS) graded and tested wheat protein content. Official grade, protein, moisture, thousand kernel weight and falling number tests were determined on each sample. The remaining tests were conducted on 3 composite samples categorized by protein ranges of <9.0%, 9.0% to 10.5%, >10.5% and one composite of all WC samples. The methods are described in the Analysis Methods section of this booklet. ABOUT DURUM WHEAT Durum is the hardest of all wheats with high protein content, yellow endosperm, white bran. Used to make pasta, couscous and some Mediterranean breads. The Durum Quality Lab, North Dakota State University, Fargo, ND, conducted the quality analyses. Official grade, test weight, vitreous kernel, thousand kernel weight, protein and falling number were determined on each sample. 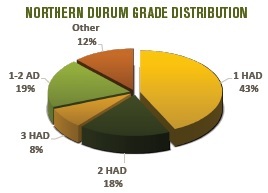 The remaining tests were conducted on 6 composite samples categorized by growing region for Northern Durum. Northern Durum production area is highlighted on the map on page 28. 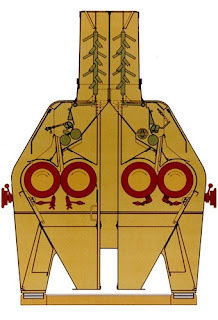 The methods are described in the Analysis Methods section of this blog. ABOUT HW WHEAT Medium to high protein content, hard endosperm, white bran. Used in Asian noodles, whole wheat or high extraction flour applications, pan breads and flat breads. 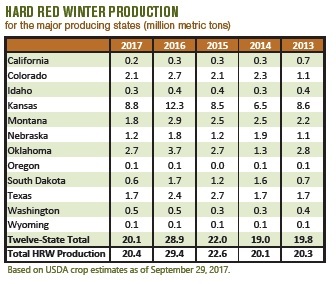 52 samples Collected by state and private inspection agencies; commercial wheat handlers; Plains Grains, Inc.; and state wheat commissions. Official grade factors were determined on each sample. Non-grade factors and functionality tests were conducted on 6 composite samples categorized by growing region and protein ranges of <11.5%, 11.5% to 12.5% and >12.5%. The growing regions are highlighted on the map on page 23. The methods are described in the Analysis Methods section of this blog. Highest protein content, hard endosperm, red bran, strong gluten, high water absorption. Used in pan breads, hearth breads, rolls, croissants, bagels, hamburger buns, pizza crust and for blending. The HRS Wheat Quality Lab, Department of Plant Sciences, North Dakota State University (NDSU), Fargo, ND, collected samples and conducted quality analyses. Official grade and non-grade factors were determined on 60% of samples. Functionality tests were conducted on 24 composite samples categorized by export region and protein ranges of <13.5%, 13.5% to 14.5% and >14.5%. 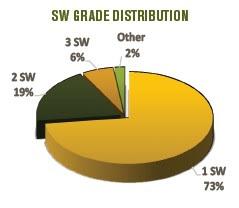 Production-weighted results are presented as Composite, Eastern and Western Region averages based on composite samples. Eastern and Western Region states are highlighted on the map on page 16. The methods are described in the Analysis Methods section of this blog. Hard Red Winter wheat is Medium to high protein, medium hard endosperm, red bran, medium gluten content, mellow gluten. Used in pan breads, Asian noodles, hearth breads, hard rolls, flatbreads, croissants and general-purpuse flour. This data from 492 samples, collected from grain elevators in 44 reporting areas when at least 30% of the local harvest was complete. USDA/ARS Hard Winter Wheat Quality Lab, Manhattan, KS, and Plain Grains, Inc, Collected samples and conducted quality analyses. The key step in the quality process is the blending of wheat known to the miller as the “wheat grist”. Based on the type of flour and characteristics, the miller decides which wheat and in what proportions should be used in the grist. The grist for a flour is chosen by a variety of methods. But it is generally based on the miller’s experience, wheat quality characteristics and knowledge of the customer’s process and needs. Blending wheat prior to milling is a very popular way of producing flours but it does have some disadvantages. Each wheat grain in a grist has its own irregular characteristics, depending on its variety or source, such as grain size, shape, hardness, moisture content, protein quality, and quantity.